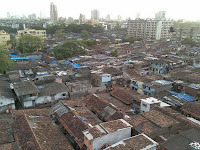 UKYIE 09 - Thoughts on Mumbai. Coming on to the city itself, Mumbai can be summed up in one word – chaos. I wouldn’t even say organised chaos. I would agree, that it does seem to somehow work, but I’m damned if I know how. I’ll save you lengthy descriptions of the traffic, the remarkably unfinished state of almost every area, the largely dreadful roads or even the beggars, street children, hawkers or eunuchs, you can get that from any guide book. What I will say this that outside all of this Mumbai and its residents impart on their guests a remarkable and truly infectious feeling of opportunity and enthusiasm for change and the new. There’s a feeling that anything can, will and probably already has happened here. However, in my opinion the most charming aspect of the city is the feeling or being very relaxed with the unknown which comes out of its chaotic nature. As was eloquently expressed by Tas, our host from the council: there’s no point getting worked up about punctuality here, for example: due to the traffic it could take forty-five minutes to get from one place in the city to another but it could take an hour and a half, there’s really no way of knowing. As a result the city, and therefore business within it, is laid back and open to change and opportunity. It’s really rather infectious and to be honest I’m a little sad to have left. Fascination to hear how you are getting on. Look forward to reading more.